Back in the early 1990s, electric car tech was taking off with the quickness. Manufacturers were dabbling with BEVs in a way that actually looked like could fill a need in the market. California legislators were said to be the catalyst for this, as the state demanded at least 2% of all offerings in the state be zero-emissions vehicles. 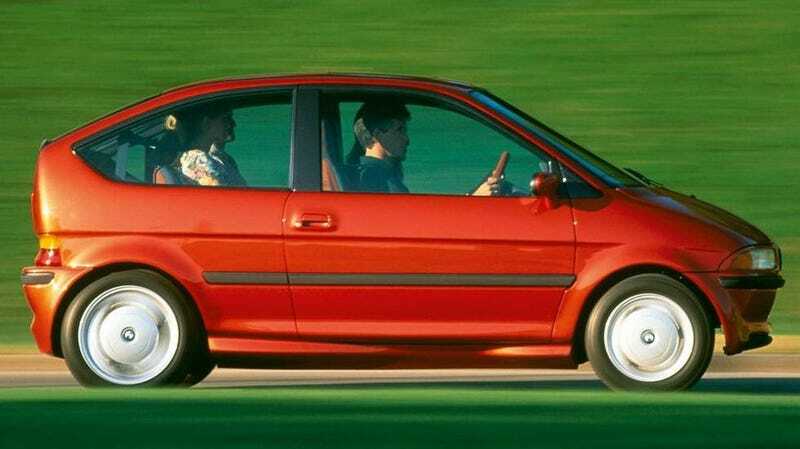 GM threw its not-insubstantial development efforts behind the ill-fated EV1, and BMW’s Technik think tank drew up this incredible electric four-seat city car with a 155 mile range. Allegedly—with BMW’s mysterious quick-charge advancements—the E1 could get a full charge in just two hours. On a regular household plug, the E1 could charge between 6 and 8 hours. Even with less efficient sodium sulfate batteries (19.2kWh worth), the E1's range and charge capabilities outshine even that of BMW’s current EV city car i3. Just about a week ago my wife and I were having lunch at the restaurant Boxenstopp located inside the Porsche museum. We were in Stuttgart for the night with nothing better to do, so she asked if I wanted to pop over to Munich to see the BMW museum as well. Not one to turn down a road trip, I immediately said yes. And I’m glad I did because the lone remaining BMW E1 was there. Most enthusiasts would immediately jump to the tropes of EVs being heavy and largely uninspiring, but BMW was able to imbue the E1 with a super light body with all of the weight sitting quite low and within the wheelbase. Somehow the engineers managed to keep the E1's weight at just under 2000 pounds. One brilliant way they’ve managed that (on the first gen) is by bolting the outer wheel rim directly onto the braking system’s drum hubs. With 45 horsepower and 111 lb-ft of torque, it wasn’t exactly the quickest car in the world, but it would hold its own in city traffic with no transmission to shift or rev range to throttle out. Instant availability of torque was then, and remains, a benefit of EV motors. The E1 was intended for small series production (think along the lines of BMW’s Z1), but was largely used as a test bed for a planned E36 3-series EV. That is, until an unfortunate series of events befell the project. BMW’s headquarters big wigs were concerned with the expense of the project. BMW Technik was focused on EV tech, but were blowing through stacks of cash in the process. There were concerns about the project’s viability, as well. With no publicly available charging infrastructure, the EV was unlikely to catch on immediately, which would require an even larger money spend. The fate of the E1 was sealed when, after the updated design E1 was shown in 1993, the earlier red car burned to a crisp in a charging mishap. The OG E1 self-immolated, taking a bit of a building with it in the process. Imagine what BMW could have done with EV tech if they’d been dedicated to the BEV cause since the early 1990s. If BMW Technik had been allowed to continue the project and launch an electric 3-series, just imagine the long-term ramifications. With lithium battery tech and more advanced motor controllers, the E1 could have been a serious city car contender that wasn’t too boring to drive. Hell, an electric 5-series could have beat Tesla to the punch. I love the E1, and I will defend it. To the death, if necessary.